Kransekake, with its tower of graduated almond paste rings, is the signature cake of Norway and a staple at wedding, anniversary, birthday, and holiday celebrations. Inexpensive and remarkably easy to prepare, it offers the added benefits of being gluten- , wheat-, and butter-free. The speciality KRANSEKAKE RINGS typically used to prepare this remarkable cake are worth the investment, for in addition to preparing special-occasion cakes, you can also use the cookie-like kransekake rings to form one-of-a-kind edible baskets and cornucopias as lovely centerpieces for your table throughout the year. top-decoration could be added (a wedding couple for a wedding etc) Here I just used flowers. Pour the water in a pan and blanche 1/2 half of the raw almonds in boiling water until the nuts float to the top of the pot, about 5 minutes. 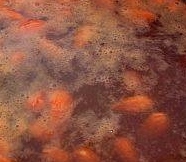 Rinse the newly blanched almonds in a colander under cool water. Remove and discard skins. Your unblanched almonds need to be completely dry before grinding. Place on a baking sheet and allow to air dry over night. Grind the unblanched almonds in a almond grinder or a coffee / spice grinder (don't use a food processor for this, for it will over-process the almond flour). Repeat the process with the blanched and dried almonds. 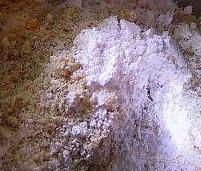 Mix together the unblanched and blanched almond flours and the confectioner's sugar. Then, run this mixture through your grinder a second time. 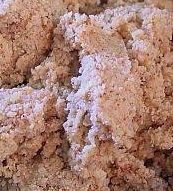 Combine the ground almond-sugar mixture with 3-4 egg whites and 2 tsp. almond extract. Knead the almond paste mixture over low heat until the sides of the paste pull away from the pot, about 5 minutes. The paste will have the consistency of homemade play dough. Wrap the paste in plastic wrap and refrigerate over night. Preheat your oven to 200 C º. Flour a pastry board or clean counter with potato starch flour; butter and dust six kransekake pans (if using) with potato starch flour. Roll the almond paste into 18 1,3 cm"-wide "snakes," descending in length - in 1,3 cm increments - from about 50 cm" long to 30" long. Fit the snakes into the forms, pinching the ends together tightly to form rings (Note: with this dough you can easily re roll a few snakes if you've miscalculated the lengths so that they are evenly divided to fit the graduated rings of the kransekake forms).Fit the lengths into the kransekake forms. Bake in the center of oven about 10 minutes, until the rings turn a light gold. Watch carefully, as they will burn quickly if unattended. Remove rings from oven and allow to cool in pans. Rap the pans lightly on a counter to loosen, running a knife between the rings if necessary to separate. Then, carefully remove the largest ring, invert it, and place it on a serving or cake plate. Mix together the confectioner's sugar, 2 egg whites, almond extract, and lemon juice to make a thick frosting. Place into pastry bag (small tip) or in a plastic freezer bag with the end snipped off. Pipe the frosting in a wavy pattern around the circumference of the bottom ring (the frosting, while decorative, also serves as the glue that will hold the cake together). Decorate with edible or crystallized flowers and ribbons if using as a wedding or special occasion cake. Or, do as the Norwegians do and decorate your tower with flags. To make the Kransekake stick together you can also use melted sugar as glue. Melt sugar in a frying pan and use a wooden spatel or knife to put some on the rings to make them stick together. Be really careful since the melted sugar get extremely hot and you can burn yourself. Use melted sugar to even glue the flowers and leafs or decorations. When serving the Kransekake you can use it as a table decoration and place extra rings in broken pieces around to be eaten first. As these end you take loose rings from the bottom and break into pieces and keep the remaining cake in tact for decoration. Left overs can be frozen and taken out to eat at any time and will taste as good as new, maybe even better!